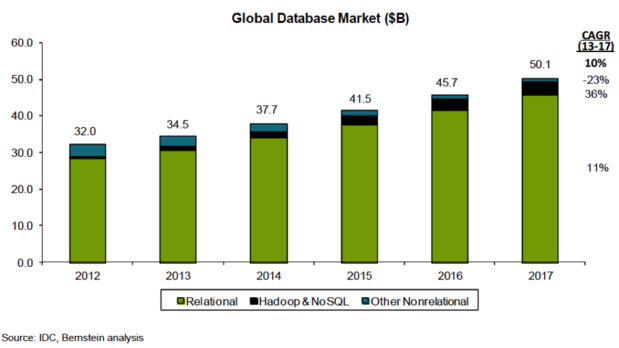 The database market is about $45 Billion with Oracle, Microsoft and IBM dominating the paid enterprise market in revenue, MySQL, PostGres and NOSQL databases such as Mongo and Cassandra leading on the opensource side, and distributed databases such as Hadoop doing well in pockets for specialized applications. The large companies that need high end features still rely on very expensive databases such as Oracle, Terradata, IBM’s DB/2 and SAP’s in memory HANA. Microsoft SQL Server is more prevalent as a departmental solution. As the type of applications has changed dramatically, the biggest driving factor among new app developers has been the reduced friction to get started, costs and ease of use (easy to learn, easy to maintain and scale). 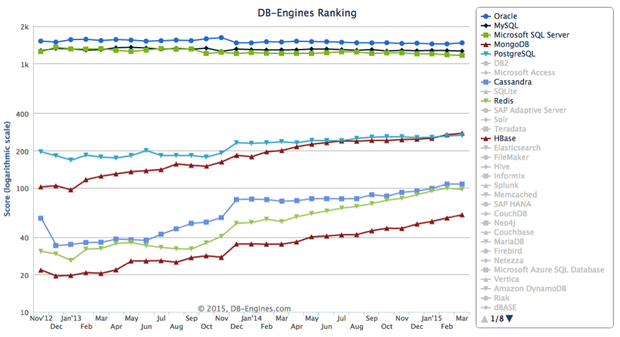 Which is why databases such as PostGres are starting to do very well as is Amazon’s (Relational Database, RDS). Most applications that are simple to start with tend to use basic features that databases offer, so many developers start to choose PostGres or another OpenSource database. With Oracle’s purchase of MySQL, there has been a big shift away from that software to PostGres. As applications start to mature, gain more traction and grow, developers are starting to explore column stores, NO SQL databases and other options as well. The selection of a database used to be driven by high end security, performance and how extensible they were, it is increasingly being driven by convenience, ease of use and price. From the 1980’s to the 2005 time frame, you could make money being a DBA or database administrator and earn upwards of $150K to $250K, managing the complex systems on top of which internal applications such as ERP, HR and CRM systems were built. There was a large market for database tools as well, to help these DBA’s. With the advent of the cloud, and move to developers managing, deploying and maintaining apps, the choice of database has been relegated to “what works, what’s cheap and what is easy to use”. Most developers are starting to make the choice of technology stack – Node.JS, Angular.JS, Meteor.JS, Ruby on Rails, etc. and use the default database that is supported by the stack they choose. So the market for database tools and DBA’s is going away to a large extent. Except for maintaining those legacy applications. The opportunities are in providing optimization, tuning and application level services instead of the database management capabilities in the short term. If you are a developer, I’d love to talk to you about your choice of database and stack to understand this market better. Tweet to me and we can setup a time. Eager to know the methodology followed for ranking databases.